Muslims in Albania sheltered Jews from the Nazis in a little-known secret of World War II. Johanna Neumann is on a journey more than 70 years in the making . . . a journey that started in Germany. She left Hamburg when she had just turned 8. She remembers it because, she says, "this was such a dramatic experience." Her life changed in the violent darkness of November 9, 1938, during Kristallnacht - the Night of Broken Glass. It was when the Nazis launched a vicious assault on Jewish communities - looting homes, destroying businesses, burning synagogues. It was an ominous preview of the horrors to come. "He had all of this correspondence and photography, photographs and so on of his youth, of his life," she said. "And he had made arrangements with the superintendent of the house that he could burn his things in the furnace. And you know, like every piece that he burned was like a piece of his life being thrown away. It's a whole life that you're putting on fire." A few months later, little Johanna and her parents were gone, leaving Germany for good. But on this day, Johanna's journey won't take her back to Germany. Instead, she's returning to an unlikely safe haven . . . and a reunion with her improbable family. Edip Pilku is anxiously waiting to greet the woman he hasn't seen in about 62 years, but he clearly hasn't forgotten her: "Memories are forever." "Will we cry or not? Will we kiss or not?" he pondered. You could say Edip is Johanna's brother . . . at least, that's what they told the Nazis. "The families surrounding us didn't know that we were sheltering Jews," Pilku said. "My mother had spread the word that they were her relatives from Germany." "That was the cover story?" Axelrod asked. "That was the cover story: We're Germans from Germany, and we were her family." There are a number of extraordinary examples of people around the world who risked, and sometimes lost, their lives hiding Jewish families during the Nazi occupation. But the Pilkus were in Albania, a 70% Muslim country in southeastern Europe. "The gem of this story is that Albania took in refugee Jews," said Deborah Dwork, who has written a book about Jewish refugees during World War II. "Europe 1938, '39, '40, even '41, we see it as a totally closed universe," she said. "and Jews in that closed universe, they were looking for holes, for openings. People began to whisper: 'I hear if you get to Albania, you will be safe.'" Safe, because of a cornerstone of Albanian culture known as Besa - the promise to treat strangers as if they were family . . . and guard them with their lives. "It has to do with a certain sense of honor, an honor code that they take very seriously," said Dwork. "It's not simply to give someone something -a bed for a night, a hot meal. It's really to offer protection, full protection. They judged themselves by that code, and they also knew that their neighbors judged them by that code." Like their neighbors, the Pilkus adhered closely to Besa . . . and to their Muslim beliefs that also emphasize the protection of others. "The role of Albanian culture and traditions and the religious influence of Islam came together," Dwork said. . Although Edip's mother was of German heritage, she embraced Besa and Islam, especially after the Nazis occupied Albania. "They saluted her and left!" Through all this, remember, Johanna and her parents were hiding in plain sight. "And here you are coming in contact with German soldiers. Were you scared? Was it hard for you to look them in the eyes to talk?" Axelrod asked. "You also had to make sure they didn't find out you were Jewish. "Right. Well, I think scared is probably the right word," Neumann said. "I certainly was during the occupation very much afraid that I wouldn't live the next day." According to the International School for Holocaust Studies, Albania did not turn over a single Jew to the Nazis. Instead, when the Germans demanded the Albanians provide lists identifying Jews in their country, the Albanian government not only didn't comply, it even warned Jews to hide and urged its citizens to help. In fact, after the war, there were more Jews living in Albania than there were before. It's an extraordinary record. So how is it that so few people know about it? "Because of the shutters that went down on Albania so soon after 1945 and the draconian Communist regime," said Dwork. "For the next half century, Albania was completely cut off from everyone, even from other Communist countries. And by the time the shutters lifted, what happened half a century ago was not so urgent as people's everyday needs right then and there." As seen in the upcoming documentary, "God's House," photographer Norman Gershman traveled to Albania to document surviving members of families that saved Jews during the Holocaust. Gershman said, "I had to find out what these people did." Among them: Edip Pilku. 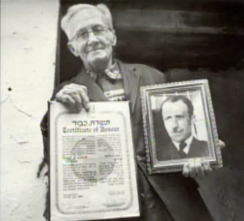 He's pictured holding a plaque indicating his mother and father were honored as "righteous among nations." "Johanna and her family gave testimony that 'Yes, this family saved our lives.'" And Johanna says her own parents, who both died in 1961, always wanted to make up for the way they parted with the Pilkus all those years ago. Edip said their parting was very hard for him, too: "I don't even know how they left. My mother pulled me to the other side as she didn't want me to get sad, I wouldn't know. They left … hastily." The Allies whisked 14-year-old Johanna and her parents out of Albania in September of 1945. "We were told that we cannot even go and say goodbye," Johanna said, "because there was danger that we might get arrested. It was much to my parents real regret. Terrible regret . . .No chance to say 'thank you.'" Finally, decades later, she had her chance. This was Johanna's journey. 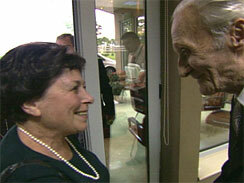 "When you saw him again, sixty two years later, can you describe that reunion?" Axelrod asked. "Well, in a way, it was a little bit strange," Johanna said, laughing, "because I left a little boy, and here was an old man! It was very emotional, there's no question about it." After the war, Johanna's family settled safely in the United States. But in newly-Communist Albania, a very different fate awaited the Pilkus. They quickly went from being the protectors to the oppressed. And their life together as a family ended in tragedy when Edip Pilku's father was arrested and executed by the Communist regime. "Here was such a good human being," Johanna said. "He was shot for what? I don't know for what." Johanna Neumann spent years trying to honor the family that saved hers. Her deepest satisfaction came only recently in a conversation with Edip Pilku's daughter. "I got my reward," Neumann said. "She said, 'I am so proud to know what my grandparents did.' And that was really my main purpose, because he was executed by the Communists so, 'What do the grandchildren think?'" "I see a very modest son, very proud of his family and proud of what they did and seeking nothing, nothing other than saving people who were desperate," said Gershman. "These people were courageous," said Neumann. "They were righteous. And they were just wonderful people."